We believe that paddling a new boat or SUP is a crucial step in the purchasing process. As such, we offer demos of all of our retail kayaks and paddleboards. Furthermore, we credit three days of rentals toward the cost of a new boat. To reserve one of our demo boats, call the shop at (530) 581-4336. Keep in mind that we only have one of each model. 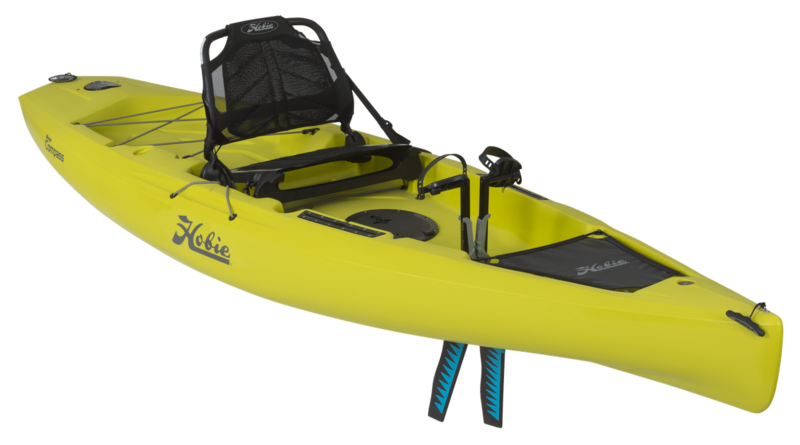 Set your course with the new Hobie Mirage Compass, the newest addition to Hobie’s fleet of award-winning fishing kayaks. Simplicity defined, its time-tested MirageDrive pedal system with Glide Technology moves you easily through the water. Outfitted with a breathable mesh seat, the Compass offers maximum stability and an oversized cockpit and flat deck for standing. Built around the comfortable Vantage CT seat, the Outback is so stable you might be tempted to stand when you cast. Studded with thoughtful features such as molded-in rod holders, generous below deck storage options, and the smooth Twist and Stow rudder, the versatile Outback is ready for your outdoor adventure. 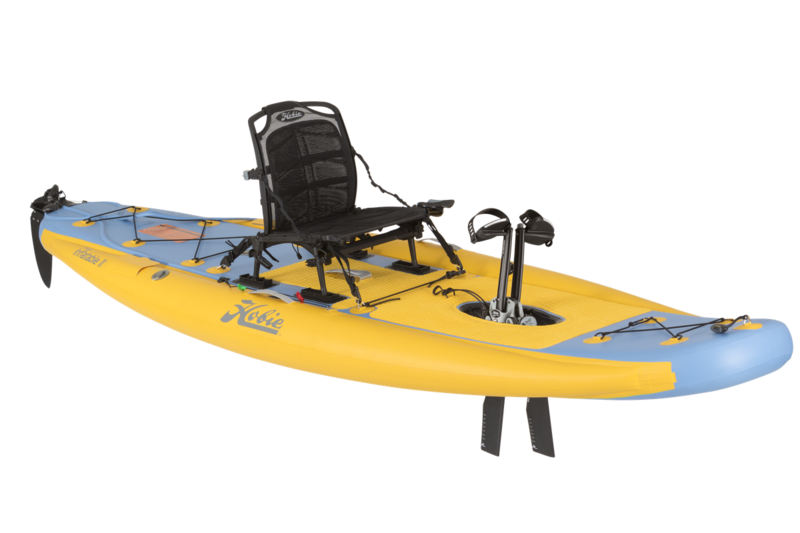 Ideal for small-to- midsize kayakers, or bigger kayakers out for an unencumbered cruise, the Revolution 11 allows you to adroitly stalk fish and confidently explore reefs. With generous below deck stowage, smart rigging on top (what’s a kayak trip without a cold drink right at hand? 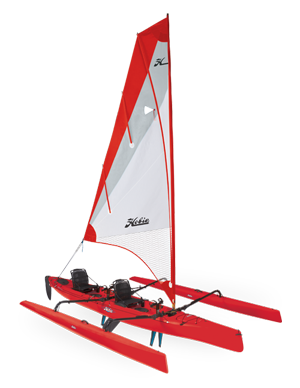 ), and optional sailing kit, the Revolution 11 is ready to roam. It is catchy too, with dual rod holders and plentiful tackle storage. If you crave a change of pace from hands-free MirageDrive motivation and pick up the paddle, the “Revo 13” still makes tracks. If this is a floating SUV, it’s one that loves a twisty, challenging track. The lightweight, rotomolded hull sings when under optional sail kit power. 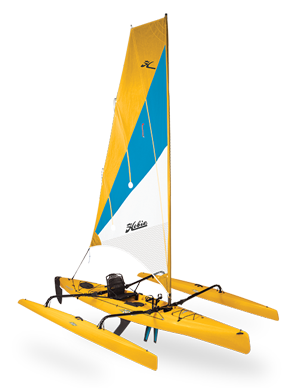 The Hobie Kona is a round peg that fits many different holes: in two-person configuration, it provides a stable ride and snappy, spin-in-a-second performance; when paddling alone, the boat’s molded center seat keeps the boat sitting on her lines. 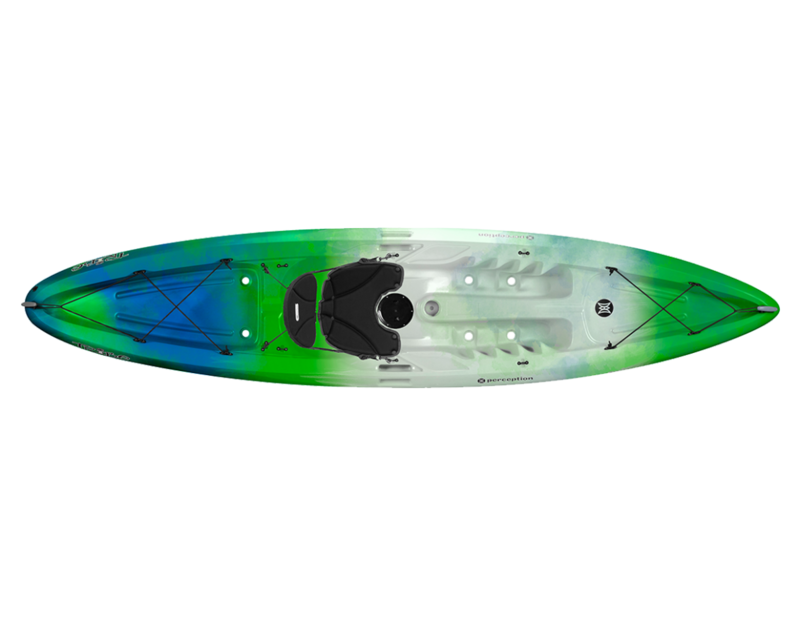 The Kona’s rotomolded polyethylene hull couples a wide beam with a relatively short waterline, delivering the responsive, stable performance usually found on longer boats. 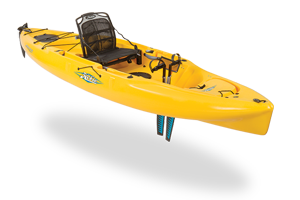 Carrying handles and on-hull paddle storage simplify portaging, and the deluxe, adjustable padded seats support your back and encourage longer excursions. Two MirageDrives simplify locomotion, and an optional Sail kit enables you to enjoy everything from a sunrise paddle to an all-day, multi-sport adventure. The i14T’s wheeled storage bag and its pump make hauling, storing and inflating the boat a snap. 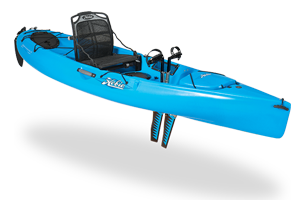 Its rugged, PVC-vinyl build and rubberized underside—coupled with its easy-to-grip carrying handles—facilitate smooth launching, landing and portaging. 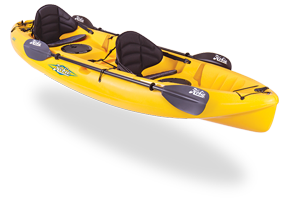 As the name suggests, this kayak strikes a perfect balance between two worlds.The Equinox brings together the comfort and stability of recreational kayaks and the performance of a true sea kayak. The efficient V hull and hard chines provide stability and glide in one package. 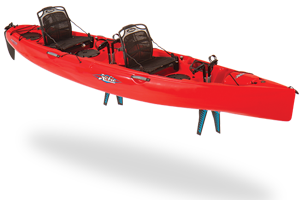 The kayak tracks well and performs leaned turns with ease. The ample cockpit is equipped with thigh braces that give excellent control even to the smaller sized paddler. The Sky 10 kayak came into existence due to the popularity of our well liked Skylark and the ever increasing demand for smaller, lighter boats. 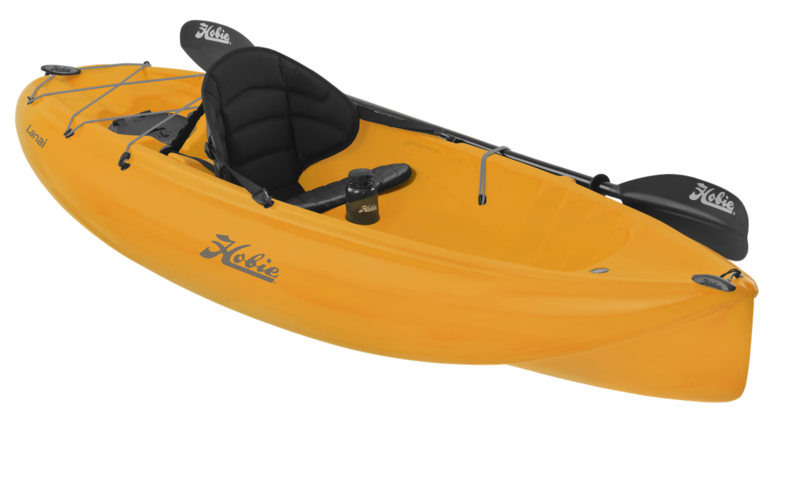 This kayak carries most of the paddling qualities and features of its 12 foot sister but sports a good 8 lbs less weight, making car-topping and general handling that much easier. The Sky 10 has more than adequate hull speed and efficiency for keeping up with groups on casual cruises and plenty of capacity for the average paddler. 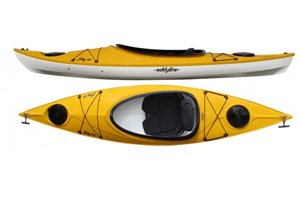 The Skylark fits into a new category of kayak considered transitional or cross over. 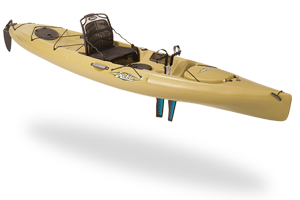 While essentially a recreational kayak in size and fit, the Skylark has been endowed with much more consideration to the features and performance found in a full-fledged sea kayak. We gave it abundant stability and a roomy fit to make the entry-level paddler comfortable, yet the efficiency to keep up with longer boats on an easy cruise. At the same time we want the more experienced paddler to have fun, so we added hard chines for carving and Greenland styling for looks. 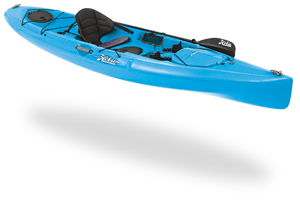 This kayak is attractive to beginners and one that they can grow in, yet also provides a lightweight and fun alternative to the more experienced paddler. Anyone can paddle this boat! 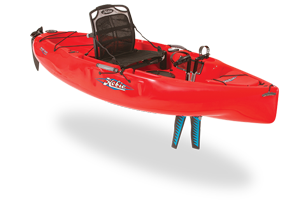 The large cockpit makes getting in or out of this very stable recreational kayak a breeze, even from a dock or boat deck. Take along your kid, your dog, your camera, the groceries, oh – and don´t forget the fishing rod. It´s stable enough to land a big one. The Sandpiper is easy to maneuver in those backwaters while bird watching and small enough to fit on your yacht. It is so easy to paddle you just might want two. A perfect medium between performance and comfort, the Rio is the ideal boat for those seeking the best of both worlds. The boat easily holds its own against touring boats while also offering a small frame for easy storage and transport. 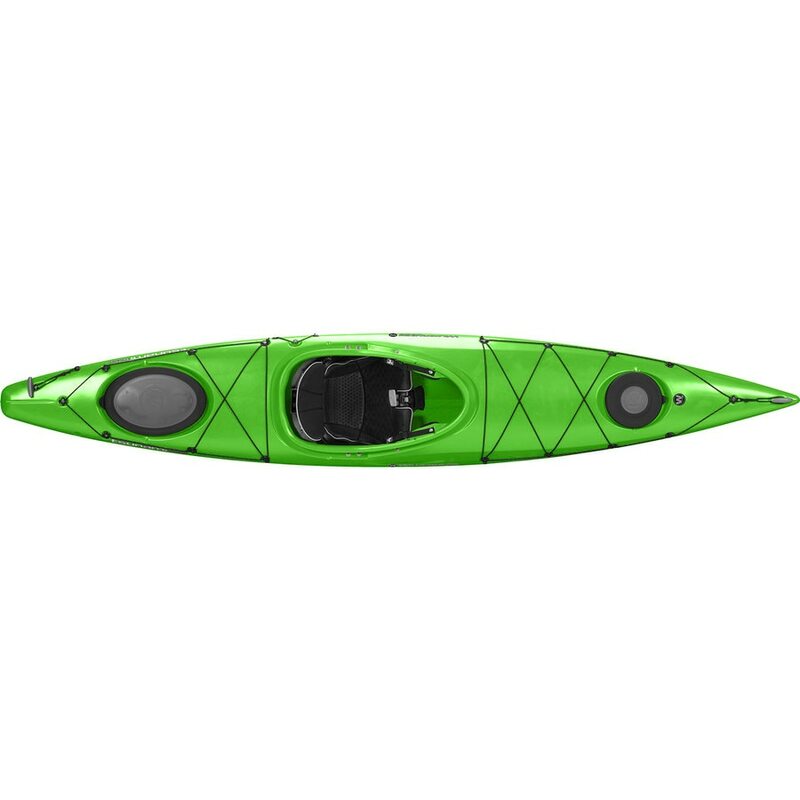 The kayak manages to fit all of the features of a long boat – fusion bulkheads, deck lines, molded thigh braces, and carry handles – into a beautiful, compact 35 pound package. This short little boat is a wonderful choice for those looking for something compact, maneuverable, and safe. The seat ensures that you will be comfortable during your paddle, no matter the place or duration of your excursion. The open deck of the Tarpon allows for easy entrance from the water as well as self draining scupper holes, letting you play without worry. 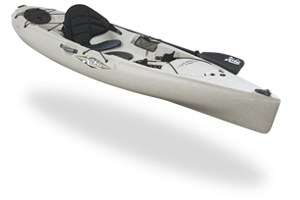 If the Tarpon line of kayaks were a family, the Tarpon 120 would be the big brother to the Tarpon 100. 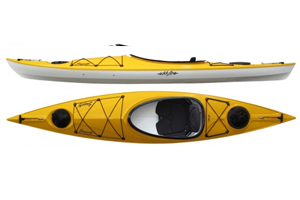 Coming in at 2 feet longer and slightly narrower, this kayak is a touch speedier and a hair less stable. 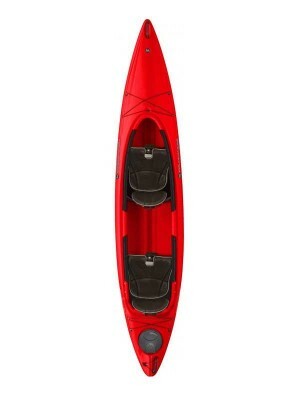 This kayak is ideal for those with a need for speed and distance. For those looking for all the benefits of a Tarpon 100 but in a sit inside model, the Pungo 100 may be the right choice. Small and compact, the Pungo is storage and transport friendly. This boat just happens to be the best selling Pungo. 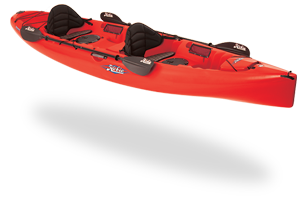 This is due to the fact that this kayak offers great speed, storage space, manageability, and comfort. The Pungo 120 is, to put it simply, a great all around boat. The Tsunami 125 features an extra half foot of length than the Tsunami 120. This growth lends itself to a faster vessel. As before, someone paddling this kayak should be able to safely and effectively rescue themselves in the case of a flip. The Pamlico 135 T happens to be our only tandem sit inside kayak. For those teams that favor sit insides, this is the ideal boat for you. 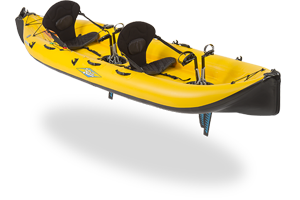 As an added bonus, the Pamlico 135T can be configured to turn into a single person kayak. 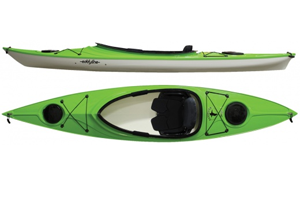 The Tribe 9.5 kayak’s versatile 9-foot-6 design makes it a top choice for beginner to intermediate paddlers. The entire family will appreciate how easy it is to get on and off this stable sit-on-top. 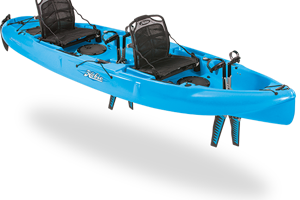 The shorter length and lighter weight eases transport and increases maneuverability as you explore flat-water rivers, lakes, ponds, and coastal waters with light waves. Ample storage and a roomy seat that’s extra-padded and adjustable will keep you out there all day long. 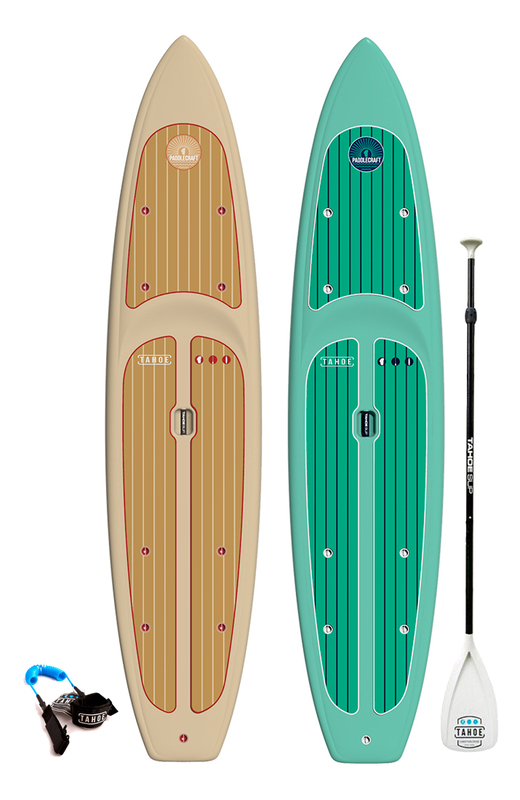 A new addition this year, the Hobie Eclipse the first paddleboard with the infamous Mirage Drive System. Rather than using a traditional paddle to get around, the Eclipse is powered by a motion similar to a stair master. 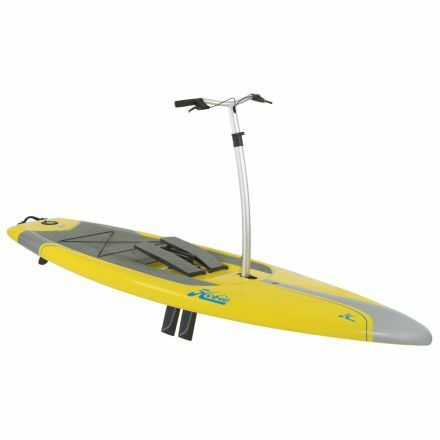 Not only does this create a whole new type of workout, it also moves the board about twice as fast as a traditional SUP. Coming in at 12′, this board serves as the longer, faster version of the 10′ Eclipse. Because this board is also wider, it does have an increase in stability. 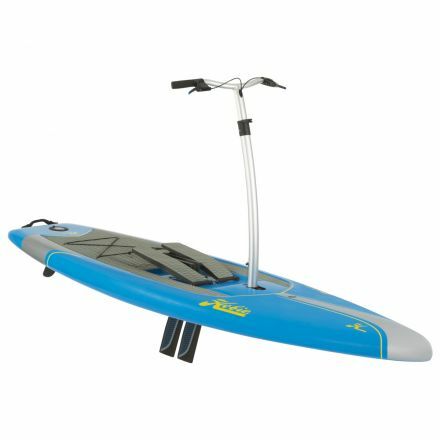 This Hobie inflatable paddleboard is ideal for the paddler looking to travel with their SUP. 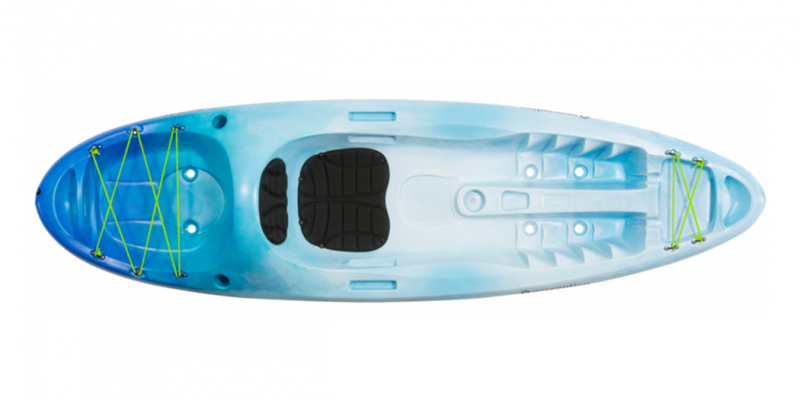 The board can be deflated to fit into a backpack with its fin and paddle, all of which are included in the price. The board can be inflated to 15 psi in mere minutes with the included pump. The Zephyr is a beautiful board, featuring a long deck and a protruding handle for transport. 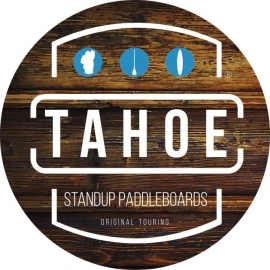 A change from last year, Tahoe SUP has modified the interior of this board to make it stronger, lighter and faster. The Bliss serves as the sister SUP to the Zephyr. 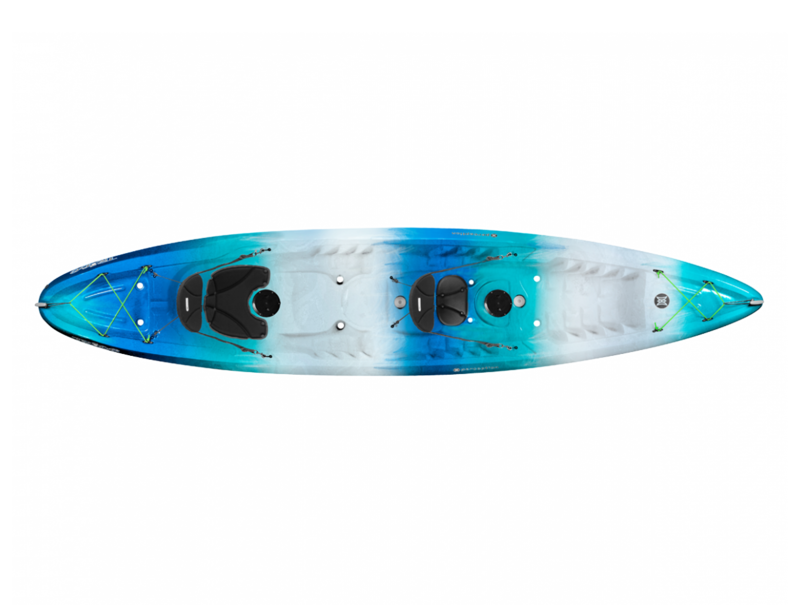 A little smaller and a little lighter, the Bliss is ideal for the paddler who yearns for a light, compact, high performance board. Like the Zephyr, the Bliss is stronger, lighter, and faster than its predecessors. 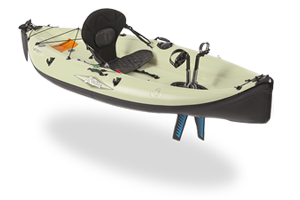 The Paddlecraft boasts features from both beginner and high performance boards. The board is durable and stable, yet also has great speed and tracking. In addition, the board has a high capacity, meaning that it is perfect to load up for longer trips. If it’s adventure you seek, the TALLAC will take you there and back. The TALLAC is designed with increased volume for a capacity that will accommodate gear for multi day expeditions or just you and two of your favorite Golden Retrievers out for a leisurely paddle. The recessed standing area maintains amazing stability even at maximum load, while the race worthy hull shape pays you back with a stealthy glide for every stroke you take. This inflatable board can deflate to fit into a bag, lending itself to the paddler looking to travel with their SUP. Furthermore, the board can be inflated to 20 psi, making a firm board that rivals a fiberglass SUP. This model is the longer version of the Alpine 12′. While it does still fit into a simple bag, this board has an added foot of length that will increase the tracking and speed of the SUP. Zoom across a secluded alpine lake or hop a flight and tour down a jungle river. Whatever you choose, rig up and set out on this glide rocker with speed and style. Our swift 2017 Carbon Nass 12’6 is made with patented Carbon Construction™ to present a rigidity and stiffness unlike ever before while still offering the same freedom of portability. With the Carbon Nass 12’6 below your feet, you can experience the unimagined at the zip of a bag.